Toothache, as the name itself suggests, refers to an aching pain experienced in and around the tooth. It is also referred to as odontalgia. A toothache can range from mild pain or discomfort to excruciating, unbearable pain. The causes for toothache include emergence of wisdom tooth, problems relating to the gums or the jaw, exposed tooth root, cavities, infected dental pulp, a marginally cracked tooth and so on. Depending on the severity of the problem, appropriate treatment needs to be given to the patient. Causes of a toothache may also be an indication of other diseases such as those pertaining to the heart, including angina or a myocardial infarction, due to referred pain. Toothache can also lead to pain in the jaw and face, caused due to some form of irritation or inflammation. Each tooth contains soft spongy tissue with sensitive nerves and blood vessels known as the dental pulp. The pulp cavity is surrounded by layers of hard tissue to protect it. The outermost layer is called enamel, which is very hard. When the pulp within the tooth becomes inflamed it causes toothache. If toothache is left untreated, the pulp inside the tooth may die and become infected. 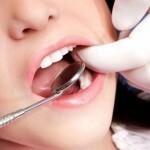 This will lead to a dental abscess forming and also cause severe, continuous, throbbing pain. Untreated toothache may also lead to blood poisoning. The following home remedies can be used to alleviate pain caused due to toothache. Garlic cloves with a pinch of rock salt can be placed on the affected tooth to help get some relief from the pain. Chewing a clove of garlic on a daily basis may also keep teeth healthy. Chewing onion daily can help teeth fight against bacteria in the mouth and can also assist with toothache. Lime is a rich source of vitamin C and it is useful in maintaining the health of the teeth and other bones of the body. It prevents decay and loosening of the teeth, dental caries, toothache and bleeding of the gums. Limiting sugar in the diet can help keep tooth healthy and keep toothache away. Rinse the mouth with warm water and put maximum strength sensodyne toothpaste in the cavity for as long as possible. Avoid fluids as this will wash away the toothpaste. In a few minutes the pain will subside and relief could last for a few hours. If throbbing pain is experienced with a toothache, placing the hand connected to the opposite side of body in iced water will provide instant relief. For example, if the toothache occurs on the right side of the face, place the left hand in the water and gently massage the v-shaped area between the thumb and index finger. This remedy is based on reflexology where the feet and hands help set the tension level for the rest of the body and are an easy way to interrupt the stress signal and reset the body’s equilibrium. Gargle with hydrogen peroxide and follow with a hot water rinse to treat tooth pain. Place 2 – 3 drops of vanilla extract on the tooth that is aching to provide instant pain relief. Put an ice cube on the aching tooth or place an ice pack on the cheek of the affected tooth for 15-20 minutes at least 3 / 4 times a day. Gargle with lime juice daily to prevent decay, loosening of the teeth, dental cavities, toothache and bleeding of the gums. Clove and clove oil can be used to get some relief from toothache. 1 / 2 cloves can be places on the affected tooth or clove oil can be used to soothe and reduce pain. Clove has astringent as well as antiseptic properties that can be used to fight germs in the cavities. Black pepper is also a useful ingredient that can assist in effectively fighting toothache. Make a paste of pepper, add a pinch of salt to it and add a little water. Applying this paste on the affected area will help reduce toothache, fight bad breath and bad gums. Toothache can often cause a great deal of pain and discomfort. Use the above mentioned home remedies to fight toothache and get some relief from the nagging pain.